Just found out today that Vue Cinema Romford will give you four hours of free parking when you park in the upper levels of The Brewery multi-storey. Take your ticket with you and when you purchase a Cinema ticket they will validate your car park ticket for four hours. Not sure if other Vue Cinemas do this when you have to pay to park but always worth asking as I didn't see this advertised anywhere and just heard the couple in front of me asking the cashier to validate their car park ticket. One more piece of information. Vue Cinema Romford are now offering Chilli Heatwave Doritos as an option instead of salted tortilla chips on their nachos. Not sure if that is national too. I believe this has always been the case - it's written in (very) small print on the signs by the ticket machines when you enter the Brewery. I've been using it for years. However, there are two things to note - you have to buy at least two adult tickets and you have to leave the car park by 6pm or else you will get charged even if your ticket has been validated. 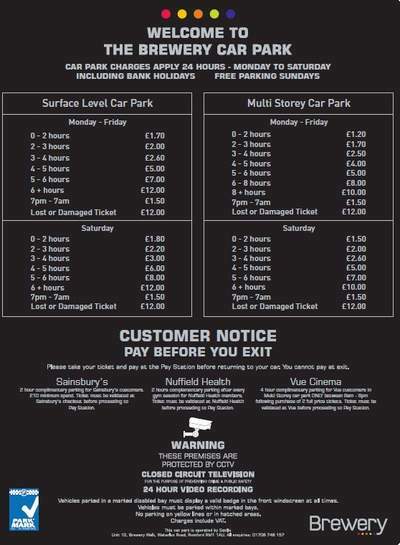 If you're coming out after six, or you've only bought one ticket, nip down to Sainsburys after the film and spend £10 and they'll validate you for two hours of parking free - it may not cover your full cost, but it'll save you £1.20 (that's what it was last time I did it). I believe this has always been the case - it's written in (very) small … I believe this has always been the case - it's written in (very) small print on the signs by the ticket machines when you enter the Brewery. I've been using it for years.However, there are two things to note - you have to buy at least two adult tickets and you have to leave the car park by 6pm or else you will get charged even if your ticket has been validated. If you're coming out after six, or you've only bought one ticket, nip down to Sainsburys after the film and spend £10 and they'll validate you for two hours of parking free - it may not cover your full cost, but it'll save you £1.20 (that's what it was last time I did it). I was Billy-no-mates yesterday as I went on my own and I only bought one Cinema ticket and the cashier validated for me. Perhaps she felt sorry for me! I was Billy-no-mates yesterday as I went on my own and I only bought one … I was Billy-no-mates yesterday as I went on my own and I only bought one Cinema ticket and the cashier validated for me.Perhaps she felt sorry for me! Could be they've changed it then, i'll have a look next time I'm there. And don't go on your own on a Monday, cheaper on a Tuesday with their Super Tuesday offer thingy!